Tampa Bay was a surprise team that just missed the playoff cut last season. 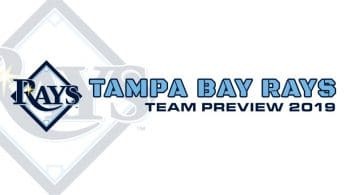 After surpassing expectations, the Rays were a team that made a few moves in the offseason. Tommy Pham moved over last season, and is one of their better bats in the top half of the order. Avisail Garcia is now a Ray, and he has been underrated when healthy. He will fit in nicely to all the other bats that continuously fly under the radar. We also need to keep an eye on Austin Meadows, who was involved in the Chris Archer deal. With Kevin Kiermaier’s injury history, we should continue to see more names in the lineup. Mike Zunino came over from Seattle. He is a low average hitter, but has loads of power. He will be a boom or bust option in the back half of the lineup. Tampa Bay was a surprise team last year, fighting in the Wild Card until the final week of the season. Blake Snell was the American League Cy Young winner, winning 21 games with a sub two ERA. He wasn’t the only reason why they won, and their rotation got a bit better with the addition of Charlie Morton. They have some very interesting young names with upside, and if they can take another step, this rotation might be in the runnings for the next few seasons as a top ten rotation. Snell and Morton is a very good one-two punch out of the gates. Morton blossomed in Houston where his strikeouts and velocity went up. Heading to Tampa is a good move for him where he should be able to keep this type of success. Morton had a 3.13 ERA and a whopping 201 strikeouts in 167 innings. Morton is moving to a better division where he faces Boston and New York compared to Oakland and Los Angeles. A tick up in the ERA wouldn’t be a surprise, but he should sit in the threes come the end of the season. Snell projections are interesting because of what he posted last year. Sure some regression will happen, but Snell has emerged as a true ace. The bullpen games worked well for Tampa Bay last season, using spot starters and all kinds of junk to win games. It worked, and it wouldn’t be a surprise to see them go with it again this season. Names like Ryan Yarbrough and Yonny Chirinos would start games and pitch a few innings before turning it over. They are in the projected rotation again this season, with the only other true starter being Tyler Glasnow and Jacob Faria. They could go a more traditional approach with those two. Glasnow came over in the Pittsburgh trade, and the stuff is there, but his ability to control his pitches has been a major issue. He is still a young arm to keep an eye on, as is Faria. Tampa Bay continues to be a place where pitchers succeed, especially younger ones. There are plenty of options for the Rays to go with this season.